The book has been featured in the top 10 Corporate Finance And Budgeting Books List by the Public Company Community. Have a look in the book! Download here a sample chapter. Find out more by meeting us at conferences. Connect & discuss BOSSA nova in our Linked In Group. Agile (continuous learning via experiments and feedback). BOSSA nova is for everyone in the company. You can start using it right away. 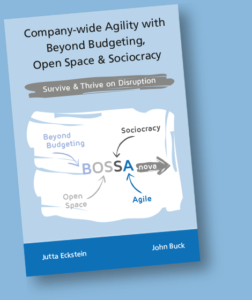 BOSSA nova makes company-wide agility possible. How can I Implement BOSSA? Implement by probing, by doing experiments to understand the complexity of your organization’s Strategy, Structure, and Processes. How can we both self-organize and stay aligned? Should we change our legal structure? Can our board of directors include a CEO, a representative elected by staff, and a customer without interfering with the board’s work? How include customer feedback in board meetings? Can we organize transformative learning? – Jutta’s upcoming events on Agile (and of course also on BOSSA nova). – Events calendar for deep dives in Beyond Budgeting. – Events calendar for Open Space by the Open Space World. – Training options by Sociocracy For All. – Events calendar on agile (un)conferences & trainings announced by the Agile Alliance. Here you find direct links to URLs used in our book. Jutta Eckstein works as an independent coach, consultant, trainer, author and speaker. 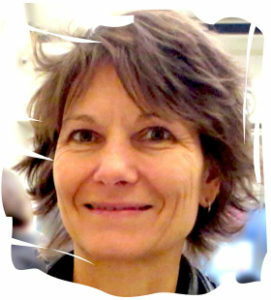 She has helped many teams and organizations worldwide to make agile transitions. She is experienced in applying agile processes within medium-sized to large, distributed mission-critical projects and has written about her experiences. She holds a M.A. Business Coaching & Change Management, a Dipl.Eng. Product-Engineering, and a B.A. in Education. She is a member of the Agile Alliance (having served on the board of directors from 2003-2007) and a member of the program committee of many different American, Asian and European conferences, where she has also presented her work. 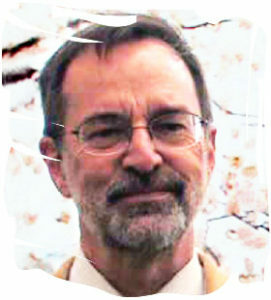 John Buck is the coauthor of We the People: Consenting to a Deeper Democracy, about sociocracy, a sustainable system for organizing and running organizations. In one sense, sociocracy is democracy specially designed for use in organizations. He heads a division of The Sociocracy Group an international training and consulting organization headquartered in the Netherlands. John has many training workshops and sociocracy implementation projects for a variety of organizations. John’s research and development is ongoing. For example, he is working with Fujitsu’s advanced software lab to develop Weaver, software that helps meetings go better – in-person, online, and asynchronous. John Buck has extensive management experience with government and corporations, including managing large information technology projects. John is the first person, not native to the Netherlands, to be certified in the sociocracy circle-organization method. His clients spanthe globe and include plastics manufacturers, colleges and universities, long-term care facilities, co-housing groups, NGOs and software company’s. By guiding clients in “rewiring” their basic power structure he helps them toward greater efficiency and increased employee engagement.